PRESCOTT VALLEY, Ariz., Oct. 12, 2017 /PRNewswire/ -- At the Energy & Environmental Building Alliance (EEBA) Conference in Atlanta, Georgia, Mandalay Homes and sonnen introduced a transformative innovation in home building and electricity grid design. Mandalay Homes was recognized with an award from the US Department of Energy (DOE) for its Discovery Home, an innovative home design which disrupts the status quo on how to build production homes in the United States. Mandalay's Discovery Home concept, coupled with the associated design for thousands of them to be implemented into a greater home development, has already been specified as a "standard" in the 2,900 home Jasper master planned community in Prescott Valley, Arizona. 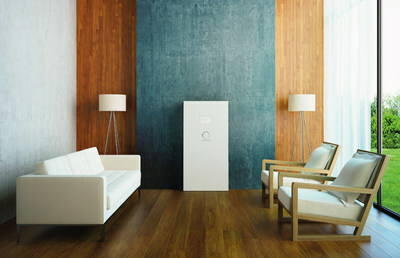 The sonnen residential smart energy storage system. This milestone achievement in green building technology will equate to just over 23MWH (Megawatt Hours) of sonnen energy storage system capacity and 11.6MW (Megawatts) of power input output potential, becoming the hallmark of the new sonnenCommunity USA. Additionally, each energy storage system in the Jasper community will possess an upgrade capability of up to 16kWh (Kilowatt Hours) of energy and 8kW (Kilowatts) of power, based on the needs of the Virtual Power Plant. Jasper's colossal footprint of stored sunlight energy will be on a scale never-before-seen in the world when considering residential energy storage in a single planned community. Mandalay Homes is partnering with cutting-edge market leader in property development, Arizona Eco-Development, to build the Jasper master-planned community. The Jasper sonnenCommunity will serve as the guiding light for future electricity grid innovation – decentralized, decarbonized and digitalized. Mandalay Homes is widely-recognized as being on the vanguard of applying energy efficient technologies to residential construction in the United States. In addition to being awarded their third US Department of Energy Housing Innovation Grand Award at the EEBA Conference on October 11th, Mandalay Homes also won the Arizona Forward Award for Energy and Technology Innovation, and was also nominated for The HIVE Award (Housing Innovation Vision Economics). These three distinct awards are all related to the same highly innovative Discovery Home project. Further, Mandalay Homes is up for two Tech Home Builder Brilliance awards in December. The Mandalay Discovery Home is a true proof-of-concept that has been scientifically tested and validated. The state-of-the-art home is focused on calibrating and integrating Mandalay's innovations in home sealing, energy efficient loads and demand control, clean energy generation via solar power, and of course, smart energy storage – all designed to create the intelligent, carbon neutral home of the future. Perhaps most importantly, this exciting home design features comfortable living coupled with extremely low energy costs for the homeowner. In addition, each of the smart "eco-homes," which will be fully implemented in the Jasper development, will be capable of communicating with each other to form a hive of systems, branded as a sonnenCommunity. The hive acts as an intelligent network of clean energy storage systems that collaborate to form a Virtual Power Plant (VPP), that has the capability to dynamically interact with the precise needs of the electricity grid on a day-by-day basis to increase grid efficiency and lower operating costs. The Jasper sonnenCommunity will seek to flatten the load curve of the community, minimize grid stress and reducing carbon footprint to an absolute minimum. Further, the sonnenCommunity network of residential clean energy power plants will create a far more resilient electricity grid, largely immune to power outages, by relying on thousands of distributed energy resources as opposed to a handful of central power plants. "Mandalay and Arizona Eco-Development have partnered to deploy a radical new residential master community design topology including clean energy generation, self-sufficiency and self-consumption via a smart energy storage system in combination with an efficient load profile and a sealed home, all anchored on intelligent grid interaction," said Blake Richetta, sonnen's Senior Vice President and head of the US Subsidiary. "This master planned Jasper community represents the single most significant innovation in how new homes can contribute to the decarbonization of our electricity grid. The 2,900 homes in which the sonnenCommunity will be deployed in Prescott Valley represent a true clean energy revolution, setting a new standard in energy efficient communities that will challenge the status-quo associated with the US electricity grid." "A true renewable energy future is not possible for our society, or for any society, without the deployment of distributed energy storage resources that properly manage clean energy production, storage, grid usage, and home energy demand in an intelligent way, providing energy independence and true carbon neutral living," said Dave Everson, CEO and Founder of Mandalay Homes. 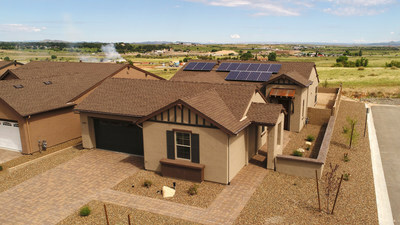 "The Mandalay sonnenCommunity concept for Jasper, as well as for other Mandalay communities like Wickenburg Ranch and Timber Sky in Flagstaff, serve to inspire leaders in homebuilding to build zero-net-energy homes with solar, energy storage and other energy efficient design concepts, creating the energy efficient home of the future." The industry-leading sonnen energy storage system harnesses excess solar energy generated during the daytime, storing it in a smart battery. Later in the day, when the sun is no longer shining, the sonnen energy storage system is calibrated to discharge and meet the specific load of the home, running the home on stored sunshine in the evening. This process is known as solar time shifting, and enables customers to utilize the abundant clean energy potential of the sun, to power the home, during both day and night. In addition to this simple concept of solar self-consumption, the sonnen system will also engage in two key grid load shifts during the course of a 24-hour cycle with the objective of minimizing Arizona's carbon footprint and helping to relieve stress from the grid, all while further lowering electricity costs for the homeowner. Essentially, the sonnen system will pull energy from the grid, partially charging its batteries, during these two key timeframes. The first load shift will be during the middle of the night (2am-5am), pulling otherwise wasted excess energy that is being produced and unused from a nearby Nuclear Base-Load power plant. The second load shift will occur during the early high solar production hours of approximately 10am-2pm. During this late morning/early afternoon timeframe, the electricity grid in Arizona has a tremendous excess of solar generated energy that is pumped into it from thousands of rooftop solar arrays, creating a highly inefficient usage pattern and even negative impact, increasing stress on the grid. The sonnenCommunity in Jasper will act as a giant receptacle for this excess solar generated energy from around the region, taking it off the grid and "time shifting" it to discharge during a peak period, dramatically increasing the effectiveness of solar power throughout the grid. The sonnen system will store this cheaper and far cleaner energy from both load shifts and discharge it to flood the morning and evening peak periods. Offsetting peak periods makes the home fundamentally invisible to the electricity grid during the high cost, high carbon footprint peak usage hours. Northern Arizona is home to an aged coal burning peaker plant, which provides evening peak power for hundreds of thousands of homes throughout Arizona. The objective of Jasper's sonnenCommunity is contribute heavily to the decommissioning of this coal peaker plant, within the next three years. "Self-Consuming locally harvested sunlight energy, while collaborating with your neighbors and with the grid, to create a clean energy community, represents a transformational design concept for the US homebuilding industry," said Christoph Ostermann, Global CEO and founder of sonnen. "The large-scale Mandalay sonnenCommunity represents an evolution in residential construction in the United States and will forever alter how American builders, utilities, and regulators view distributed renewable energy resources on the grid and what it means to 'build green!' No one told Mandalay that they should do this, as no government regulation or subsidy creates a perfect business case for this level of eco-innovation. As such, Mandalay has proven itself as a true 'agent of change.'" The Jasper sonnenCommunity will represent the first Demand Response and Grid Services Ready aggregated network of residential energy storage systems, deployed as a standard throughout a master planned new construction community in the US. Select sonnen systems deployed by Mandalay will also be able to execute demand control commands utilizing smart home devices. Specifically, sonnen will become the first residential energy storage system that integrates directly with popular home automation systems like Control4, combining smart energy storage with smart energy usage including HVAC, lights, shades and other loads, like a pool pump. "Mandalay's vision is energy savings without sacrifice," said Geoff Ferrell, Chief Technology Officer at Mandalay Homes. "Therefore, it is imperative to deploy simple load shedding techniques, in a logical and routine fashion, without disrupting everyday comfort and behavior. Our energy modeling with sonnen proves that this is possible with existing technology, and therefore is within reach for virtually any US home builder." Mandalay Homes and Arizona Eco Development would like to thank the town of Prescott Valley, Arizona, which has been voted one of the best places to retire in the United States, for their collaboration and vision throughout the process of perfecting the design for Jasper. Prescott Valley, and in particular Community Development Director Richard Parker and Mayor Harvey Skoog, have been incredibly accommodating and open-minded in their collaboration with the Mandalay/Arizona Eco-Development team. At sonnen, we believe clean, affordable, and reliable energy for all is one of the greatest challenges of our time. sonnen's signature accomplishment is the deployment of the largest distributed network of energy storage systems in the world, the sonnenCommunity, deployed in Europe and most recently Australia. The sonnenCommunity in Germany acts as both a VPP as well as a peer-to-peer clean energy trading platform. As the first mainstream grid tied residential energy storage company in the world and the market leader in Europe since 2010, with over 21,000 installed and working systems, sonnen's proven track record goes beyond their high-tech sonnenCommunity in Europe and Australia. Additionally, sonnen offers amongst the longest lasting, robust and safest energy storage systems available, good for many years of hassle free use, with peace-of-mind. Sonnen has won several awards for its energy innovations, including the 2017 Zayed Future Energy Prize, MIT's Technology Review's 50 Smartest Companies in 2016, Global Cleantech 100 for 2015-2017, Greentech Media's 2016 Grid Edge Award for innovation, and Cleantech's 2015 Company of the Year Award in both Israel and Europe. Since 1999 Mandalay Homes has been building beautiful homes with a strong commitment to quality construction and environmental responsibility. Dave Everson, owner of Mandalay Homes, is a third generation home builder with 28 years of construction experience. In 2012 Everson began to focus on Green Home Construction. Since then, Mandalay has been honored as an ENERGY STAR Certified Homes Market Leader (2016), earned three DOE Housing Innovation Awards, as well as The HIVE Award (Housing Innovation Vision Economics) and the Arizona Forward Award for Energy and Technology Innovation. Mandalay Homes has also been recognized as a winner of the DOE Production Builder Award (2014 & 2015), and the EPA airPLUS Leader Award (2015 & 2016) for indoor air quality. As a Department of Energy ZERO Energy Ready Home builder, Mandalay Homes has its sights on becoming the first U.S. production home builder to meet the stringent qualifications of the U.S. Passive House certification. Mandalay Homes is the first home builder to receive both the DOE and EPA awards.